Bathrooms are a breeding ground for germs and bacteria. Cleaning it regularly is only half the battle; an open trash bin is the norm for most bathrooms, but because they are open, the stench of the garbage fills the bathroom. What you should have instead, is a pedal bin, where you don’t have to touch the can to put your trash inside. Luckily, MYHOME offers a stainless steel pedal bin for your bathroom. It has a handy foot pedal that allows you to put trash inside without having to lay a finger on it. The best part is that these bins can be used not just in your bathroom, but anywhere in your house. Use it as your trash bin of choice for your room, kitchen or even study room. Its stainless steel design is guaranteed to add style to any room. MYHOME offers these stainless steel pedal bins for a great price. 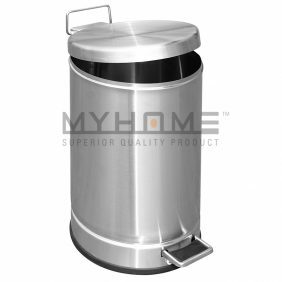 They are made from top grade stainless steel, which adds to the bin’s durability. They are available in different sizes that will allow you to choose the perfect pedal bin for your bathroom.Keep your home clean and tidy by getting a stainless steel trash bin. Get it here at MYHOME for prices you can’t refuse.